A World of Peace, or, A World Headed For Another War? In a world with around 7,000, 000,000 people, how is it that mans Governments cannot see that it is a world filled with unrest, dissatisfaction, disunity, disease, greed, power seeking, illiteracy, misery, violence, wars & recently to add to this notable list, terror! Why all of these awful results, with the paradox where in a world of awesome progress in technology, wealth with grotesque opposites? No world leader in recent times has been prepared to address these complex issues, and today as a consequence, we find appalling ever escalating and incalculable evils ready to explode like a gigantic powder-keg. The powder keg today unfortunately will not be as it has been in former times with only 50-million dead, or whatever the exact number was in the last world war; But it will be billions of human lives lost because of mans insatiable lust for power and greed, in developing such weapons of mass destruction, that he would in all likelihood wipe humanity off the face of the earth! That is the stark reality facing human-kind today, and there is no alternative on mans radar at present, because e he continues head-long in oblivion, in ignorance, without a real willingness to address the fearful scope of his own human-caused problems. Instead of world leaders agreeing with one another on territories, boundaries, rules of common decency and mutual respect, one toward another, all they can do is disagree, and fight like little children. Unfortunately for the vast bulk of humanity, this equates to a world headed of another war! And it is a war in which there will be no winners, because he, man, has developed such “advanced” weapons, (another paradox) that he has the “ability” to wipe out all life on earth. Not a glowing resume’ for such an intelligent species, when all he can do “well” is develop the means to wipe himself out! Still, even more frightening for ordinary humans who hate this total perversion of resources, and even dare I say, “defence mechanisms”, is the fat that they have developed “biological-weapons” that the evil minds of such weapons, will seek to infect vast swathes of their fellow man, in order to “win” an unwinnable war. How is it that such a gifted and incredibly intelligent species, only seems to be willing to excel in warfare, in destruction, in producing misery, pain and suffering in this world of awesome “progress”, while there are glaringly AWFUL and Appalling evils, ready to fall on the heads of it’s citizens? These are just some of the STARK-REALITIES facing a world developed by mankind, and the resulting fruits of evil. A world in which it is obvious to any with eyes to see, that mankind will never of itself produce peace, and good for it’s citizens, though the “leaders” will lie and deceive their fellow man by saying we have it all under control, there will be no war, no pestilences, or disease epidemics, no famines while the W.H.O and other man-made organisations are here; Trust us – Famous last words! The most staggering truth in all this is that the-way to real & lasting peace is available to humanity in the form of the Holy Bible. But men in their wisdom, “think” they know more than their own Creator God, whom they reject, thinking it is possible to have a creation without a Creator! I have met a man who said he taught professors and scientists, who when questioned on several areas of the so-called big-bang theory, he said; “We don’t know the answers to that”. The question was; If there was a big-bang, as you say, where did the original matter come from that formed everything we see in the heavens, and everything unseen? Another question relating to scientists theory of evolution is that man crawled out of some primeval slime, because life was apparently formed on earth from lightning striking into water? Where did the water come from? Where did the energy come from to form lightning? where did the atmosphere come from, our earth, and it’s near perfect orbital path, the rotation of the earth, and our solar system? All coexisting in perfect harmony without any deviation from it’s ordered path. How is it that the sun is the perfect distance from earth so as not to burn everything to a cinder, or to freeze in it’s annual journey around the sun, or the axis at which the earth tilts in order to produce the seasons our earth receives for photosynthesis, for heat and cold, for food and water, with the clouds being a natural sieve drawing water up from the earth, and the oceans, and river systems to give rain in due season, while other nations have drought? These are questions scientists CANNOT truly answer, “thinking” of they put enough zero’s on the end of their equations, people will gullibly believe; And the sad thing is, they do. Even the father of modern evolution, Charles Darwin stated there is no evidence that any species has crossed over from one to another. No-EVIDENCE! But still, man goes on blindly listening to nest feathering scientists who lie about there being no-God? Oh yes, that is the world we live in, a Godless world which prefers to hear the smooth things, the things that aren’t too hard, just think of the Ostrich, and you have a weird view of man. As critical as this may all seem, unless we are prepared to learn to get along with our fellow man & work out our problems & disagreements with one another, stop world leaders from stealing for themselves, and prevent scientists and other academics from their heinous tasks, this world will continue to fall head-long into the worst war the world has ever seen, or ever will see again!!! The fact that it is actually impossible for man to be at peace, to produce a world whose fruits are not violence, are not harm & misery of every kind to it’s global citizens, is a given. Academics and scientists of course will not agree with this article, and perhaps many of the educated world, a fact that will continue to plague mankind, because it is essentially a world that was begun and built upon the wrong foundation, a foundation of lies, of deception, of “get”, of man’s “wisdom”, instead of love, of take, instead of obedience to their Great Creator God, of disobedience and disbelief, and most astonishingly, of belief of a Great Deceiver, whom this world even denies exists! That is another great paradox in man’s “treasure-chest” of goodies, where he says one thing, and constantly does another. He says he wants peace, but will do diametrically the opposite to that which will produce peace. He will lie to get into Government, saying he will do good for the people, and do exactly the opposite. He pretends to know how to manage the finances of the people he is meant to be leading, and then practically bankrupts the economy he represents> In fact, most developed economies are borrowing every week just to pay down interest loans for their nations, instead of living within their financial means, they borrow today, and try to pay back tomorrow, knowing this will never happen, even though they tell you they have paid down more debt than their predecessors. Over and over, mankind has never ceased to lie, to steal from his fellow man and deceive them, and all in the cause of modernisation, of progress, of appearing to others to be someone they can trust, when in reality, man cannot be trusted, because he has ever proven throughout thousands of years of human history, that it is utterly impossible for humanity to prevent all the misery he has created in the earth. Hence, we arrive in a world filled with irreversible and ever escalating evils that are actually increasing in intensity and in momentum. What is the answer to all of these seemingly impossible woes? 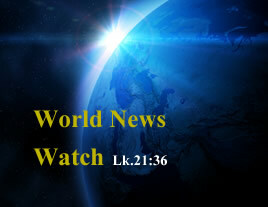 Turn Ye unto me and be Ye saved world without end! 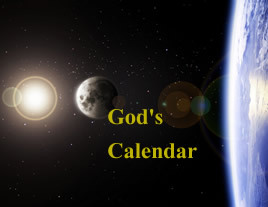 God says; “Therefore also now, says the LORD, turn Ye even to me with all your heart, and with fasting, and with weeping, and with mourning: And rend your heart, and not your garments, and turn unto the LORD your God: For he is gracious and merciful, slow to anger, and of great kindness, and repents him of the evil”. 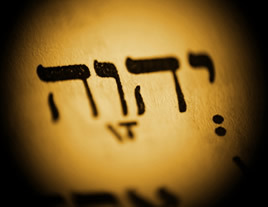 Joel.2:12-13. This is only one of hundreds of warnings in the Bible, a book which in the main, humanity has rejected, to their own destruction. One of the problems, man likes to do his own thing, and will not be told he is wrong, and there is a reason for every cause we see, and hear of, whether near or far, whether ancient, or modern, because man is not as he thinks, basically good, when it comes right down to it, men will not truly repent of his wickedness, nor will he turn to the eternal God withal his heart, and with weeping and fasting and mourning. For this, and other truths that would save mankind from all his woes, write for you free copy of the world won’t end this way. And many other provable future events. 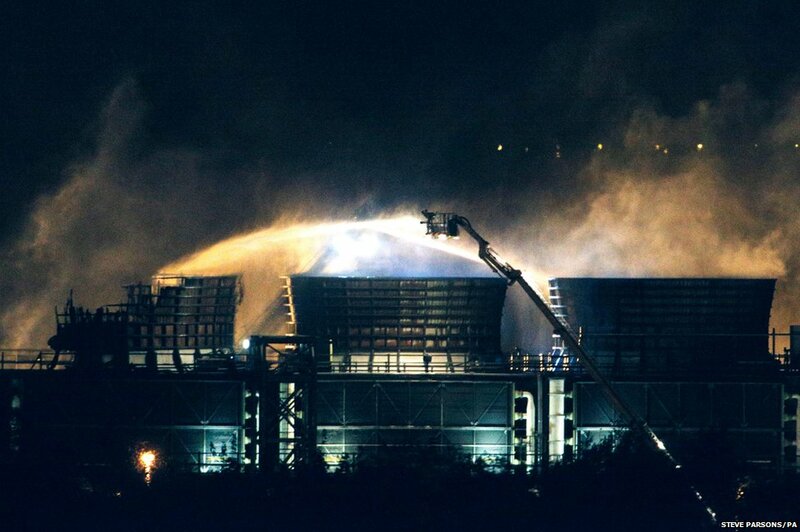 In Oxfordshire, 25 fire engines and about 100 firefighters tackled a blaze at the gas-fired Didcot B power station, which broke out at about 20:00 BST on Sunday. Widows abandoned by their families light sparklers after offering prayers on the banks of the river Yamuna as part of Diwali celebrations. 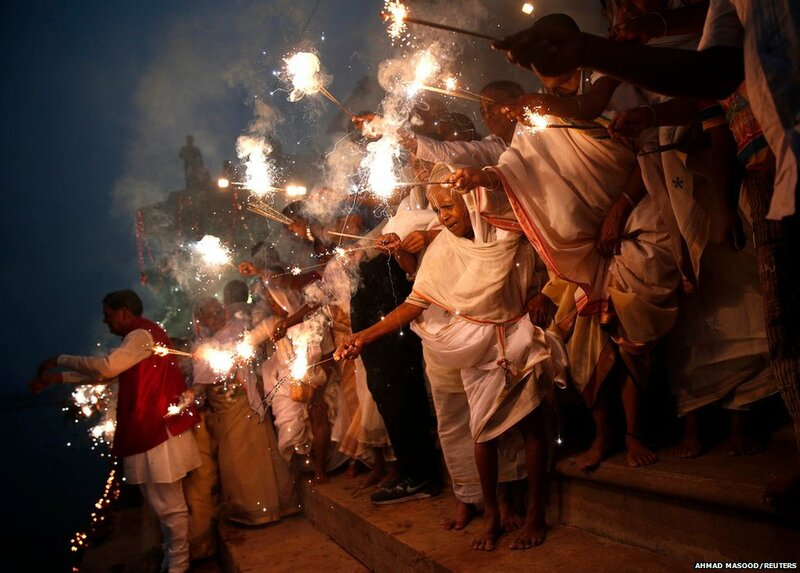 Also known as the Festival of Lights, Diwali marks the victory of good over evil and celebrates the time when Lord Rama returned to his kingdom, Ayodhya, after vanquishing the demon king Ravana. 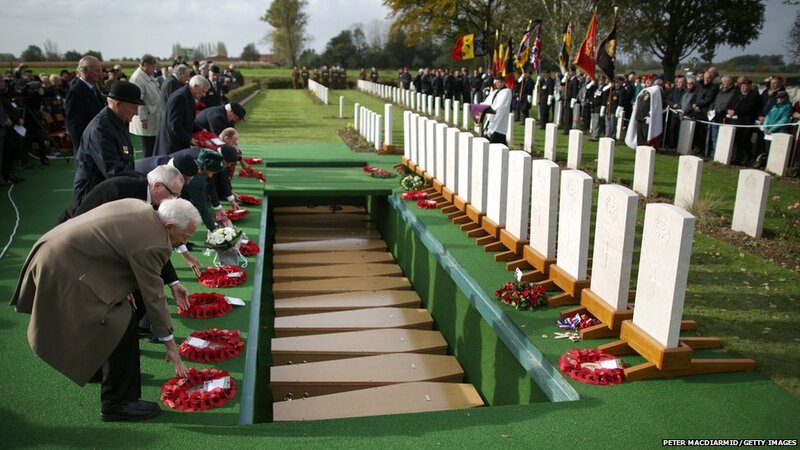 The remains of 15 British soldiers who died in World War One have been reinterred in northern France, 100 years after they were killed in battle. Their remains were found during drainage work in 2009, close to the village of Beaucamps-Ligny near Lille. 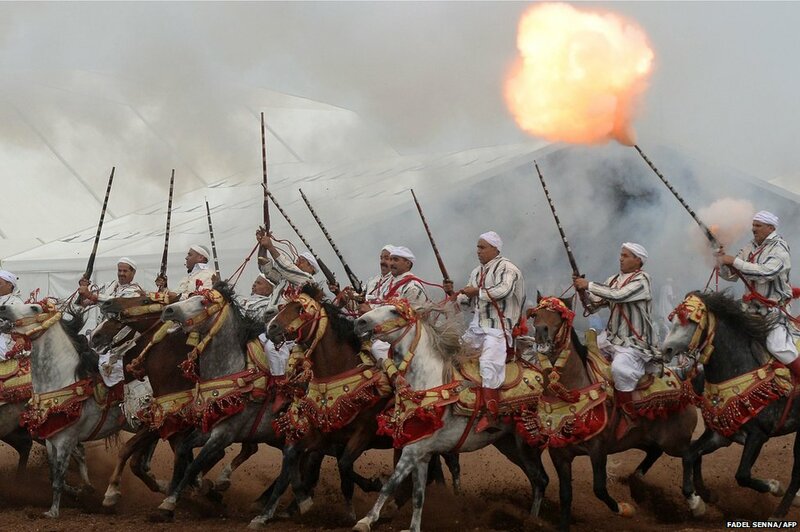 Moroccan horsemen perform during the seventh edition of the Salon du Cheval in the port city of El Jadida. Canada’s Prime Minister, Stephen Harper, insisted his country would not be intimidated, after a gunman rampaged through parliament before being shot dead. 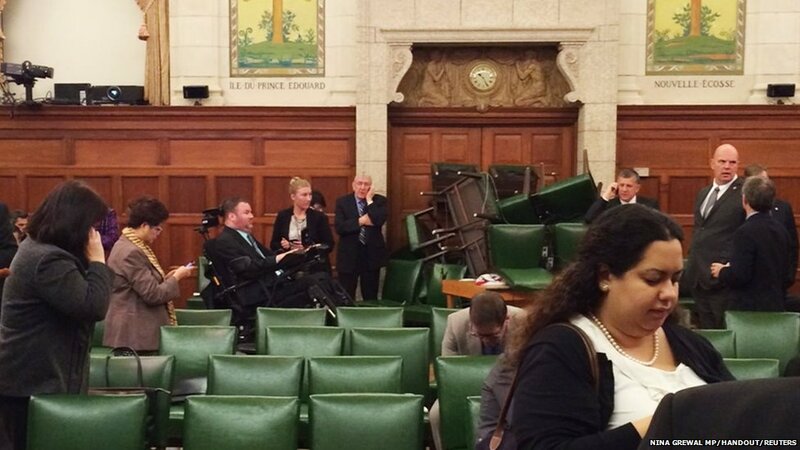 In the Conservative Party caucus room, shown shortly after gunshots were heard, MPs and staff barricaded the door. 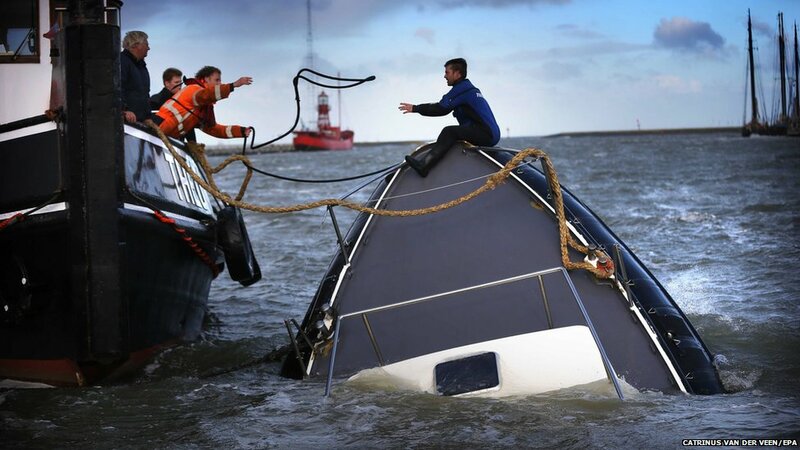 Rescuers try to save a sinking ship in the harbour off Harlingen in northern Netherlands during the first autumn storm of the year. 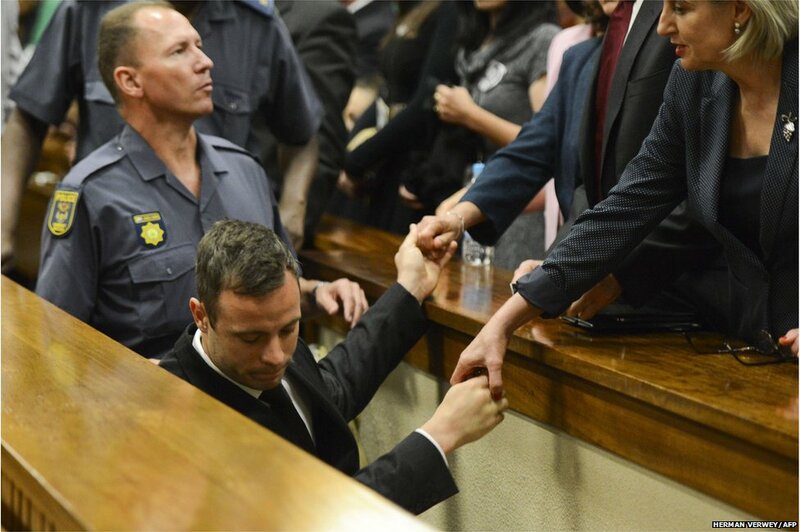 South African athlete Oscar Pistorius was given five years in prison for killing his girlfriend, Reeva Steenkamp. The parents of Reeva Steenkamp told the BBC they were happy with the sentence and relieved the case was over. The defence said it expected Pistorius to serve about 10 months in prison. 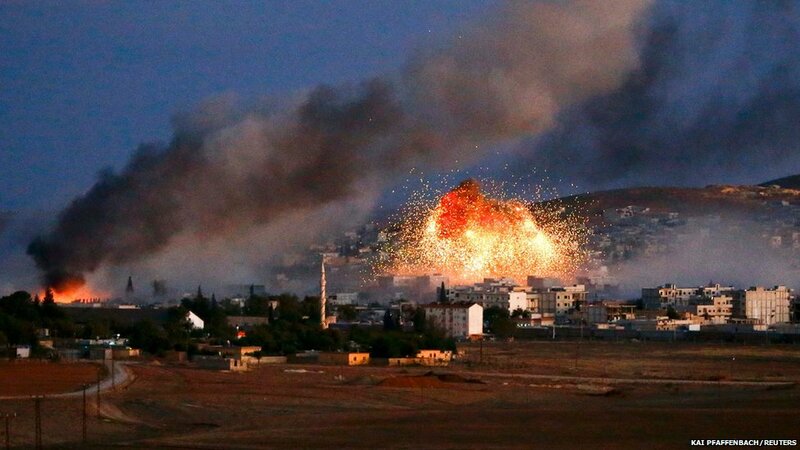 Fierce fighting erupted in the north of the Syrian town of Kobane, after days of relative calm. The clashes had begun when Islamic State (IS) militants launched an offensive “on all fronts” against Kurdish fighters on Monday, activists said. Kobane, on the Turkish border, has been under assault from IS for weeks, with most civilians forced to leave. Hiding a submarine off the shores of a foreign capital might seem a tall order, especially when you have helicopters, ships and 200 troops on your trail. But in a murky and distinctly cold war-reminiscent game of cat and mouse, that is exactly what the Swedish navy appear to suspect Russia of doing. 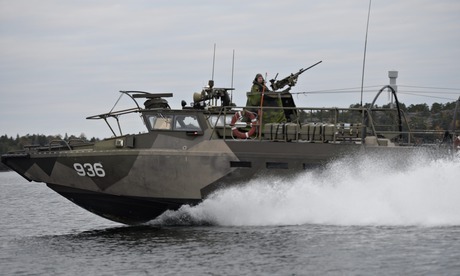 Sweden’s military has spent three days scouring the waters off Stockholm for what has so far been officially described only as “foreign underwater activity”. However, intelligence briefings to local newspapers suggest a Russian submarine might have had mechanical problems while on a secret mission in the region.